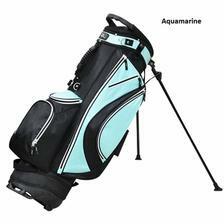 RJ Sports Aquamarine Sailor Stand Bag (9 Inches Opening) - 114.95 - GolfersEdgeOnline.com - Best Golf Equipment On The Web! !! FREE SHIPPING OVER $75.00!! If you have any more questions about the RJ Sports Aquamarine Sailor Stand Bag (9 Inches Opening); do not see the model you are looking for; need custom options; or prefer to not purchase online, then please call us at (630) 656-1291.